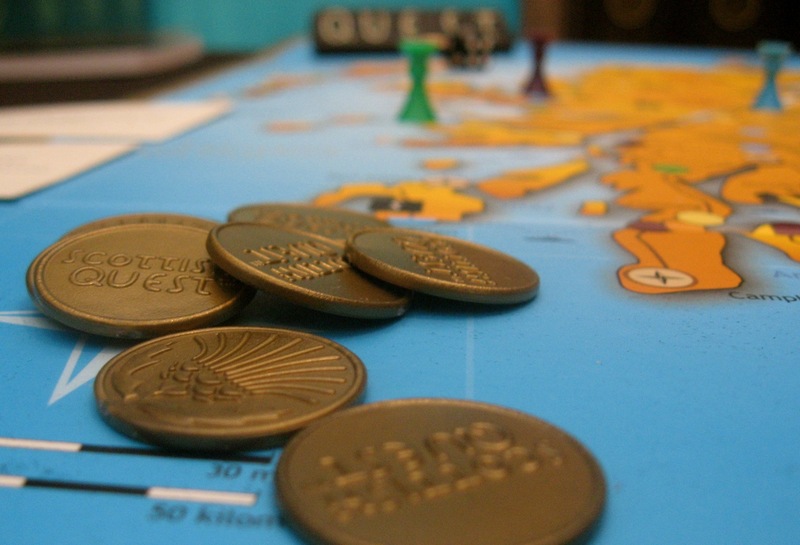 As previously reported here on the The Quest Board Games blog, Scottish Quest’s 100,000th copy was sold recently. And, as it turns out, it was a double celebration! Eddie Gordon was celebrating his 50th birthday and was thrilled to receive a copy of Scottish Quest as a gift. However, what he didn’t realise was that his copy was the 100,000th copy of the game. Entrepreneur Lynne Cadenhead, inventor of the game, presented the 100,000th copy of Scottish Quest to Eddie Gordon personally. She visited his home in Cambuslang on Burns Night to hand over the milestone edition, which was a 50th birthday gift from his partner Elaine. She also presented Eddie with some celebratory 100,000th balloons and a luxurious Burns Supper to mark the occasion. Lynne Cadenhead, owner of 1745 Trading Company, launched Scottish Quest in 2004 and it is now one of Scotland’s best selling board games. Eddie Gordon first played Scottish Quest during a holiday in France last year and enjoyed the game so much that he wanted a copy for himself. It appealed to his interest in Scottish history and the outdoors. Demand for stock was so high at the end of 2010 that the game sold out just before Christmas, so he was unable to get a copy. After finding out from Eddie’s partner Elaine that he was celebrating a milestone birthday, Lynne Cadenhead went through her Dundee warehouse again and found what turned out to be the 100,000th edition of the game to be sold since 2004. Eddie Gordon said; “I was thrilled when I found out that I’d bought the 100,000th copy of Scottish Quest and for Lynne to deliver it personally made it even better. We played it several times on holiday in France last year with friends and I really enjoyed it. It’s great fun and very educational and I’ve learned a lot about Scotland without even realising. Keep up to date with Scottish Quest on Facebook and receive daily Quest Quiz Questions on the Scottish Quest Twitter.